I feel I should apologize for how image heavy my tarot deck posts are. I'm sure it takes ages to load, if anyone is actually looking at them. For the record, I did go through and resize all the pictures and reupload them, so they're like 35% of the size they were. Hopefully that helps. If, for some crazy reason, anyone out there wants the full size files for getting them printed yourself or something like that, please feel free to message me or comment, and I'll be more than happy to send them to you. In case I wasn't clear on my previous posts though, this is NOT MY ARTWORK and these are NOT FOR COMMERCIAL USE. I own NOTHING here, except for the work it took editing and combining things. I made a lot of alterations, and assembled the frames and what not, but all of it was built from someone else's things. So I'll be more than happy to send you the files if you just want to get them printed for yourself for fun or whatever, but if I catch you trying to sell them I shall be very displeased. Also, fair warning, I'm not THAT sorry about the image heavy posts, cuz I'm about to do it again. There are an awful lot of cards from all the decks that I made alternate versions of because I couldn't decide which artwork I liked better, and I haven't posted them yet. So get ready. 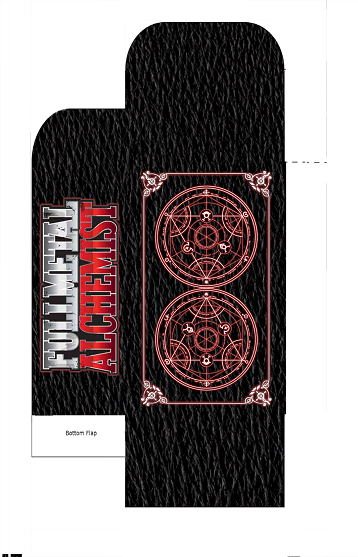 First, though, my FMA Tarot box design! 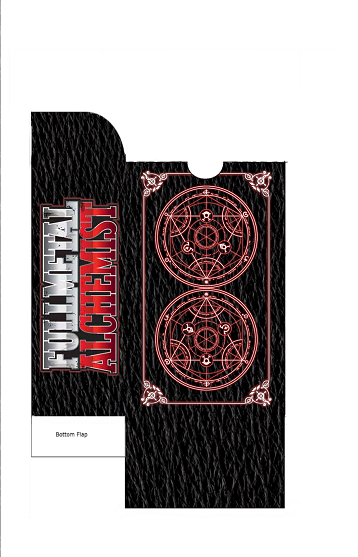 Nothing new or special, just the card back on the front and back and the series logo on the side. It was shockingly difficult to find a good transparent high resolution logo for this series. I was very annoyed with that.